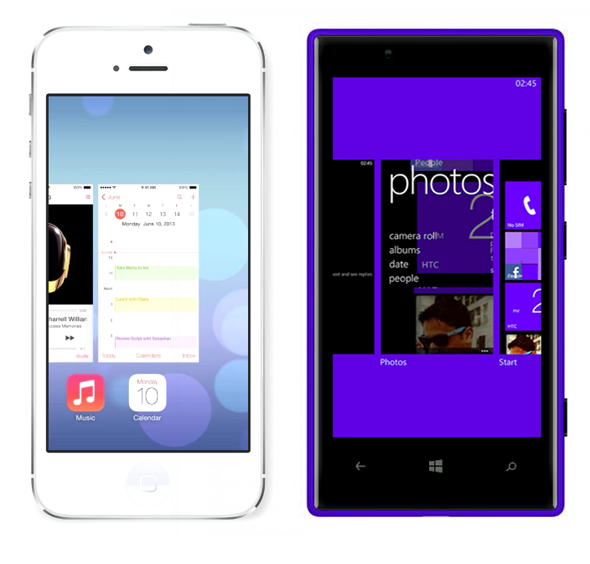 As soon as iOS 7 beta was announced and subsequently revealed by Apple on the introductory morning of this year’s WWDC, many onlookers took to the blogs, forums and social networks to note of the incredible similarities in design between it and another major mobile OS – Windows Phone. The motif of clean lines and vibrant colors has long since been a set of values associated with Microsoft’s smartphone platform, of course, but as you will see in a comparison video by tech fan Sean Rosairo, it would seem as though the fruit company has ripped more than a few segments directly from Windows Phone. Apple is often quick to throw around accusations of copyright infringement and theft of intellectual property. Steve Jobs, after all, once said that Android was a stolen product, and he was willing to go to lengths of thermonuclear war to right such a wrong. But as you will notice from the video below, the shoe is now arguably on the other foot, and it would seem Apple is now the one taking design tips from rivals in the industry. Windows Phone is a struggling platform of many limitations, notably the fact that Microsoft cannot seem to persuade man nor beast to develop anything noteworthy as it seeks to cram the Windows Phone Store. Yet one thing that has always worked in its favor is just how effortlessly easy it is on the eye, and with Steve Wozniak even going so far as to describe it as “beautiful,” the design team over in Redmond certainly knows a thing or two about interface design. I must admit, when I first laid eyes on iOS 7 beta, something in the back of my mind prompted me to think of Windows Phone. But when you see things side by side, it’s almost as if Apple has systematically taken each UI element from the stock WP8 repertoire and simply altered things around, perhaps hoping nobody would notice. Seems we have some fans in Cupertino. Jony Ive has reached the kind of cult status within Apple that only Steve Jobs could ever match, and going by his past strokes of innovative genius, I am in no way implying that he or anybody within Apple has gone out and simply copied Windows Phone. But then again, can such a strong resemblance be entirely coincidental? We’ll let you make up your own minds.